If you get our email newsletter, you may have recently noticed the change to a device-neutral, at-a-glance design. 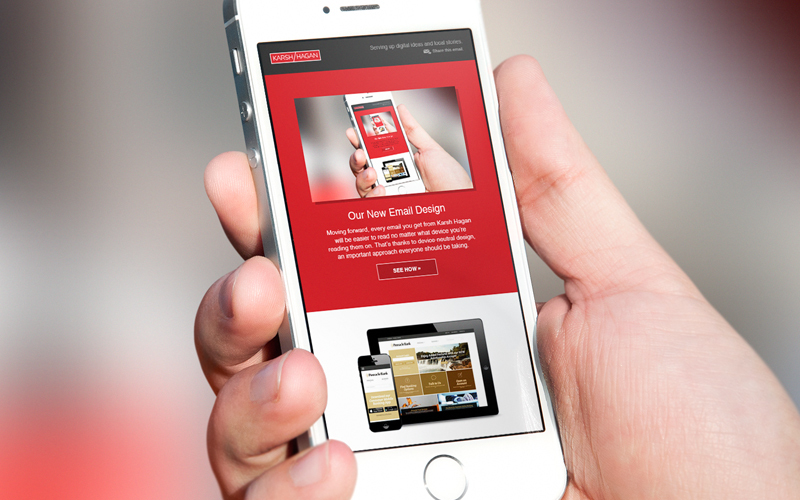 Mobile is a hot topic in email design. According to Litmus, email consumption on mobile devices has grown more than 400% since 2011, and mobile email opens hit the 50% mark in 2013. At this point, we always think mobile first, desktop second. Designing emails that look great no matter how they’re read can be a design challenge. Chances are, your recipient might view your email both on mobile as well as on their desktop or tablet. Emails must be designed for every inbox. And always consider the next click. Ensure the landing pages linked to those touch-friendly buttons look and work equally well on multiple devices. The number of screen sizes is likely to increase, therefore designing with flexibility will continue to grow in importance.